'New Journey To The West 5' drops official poster parodying 'Along With The Gods'? 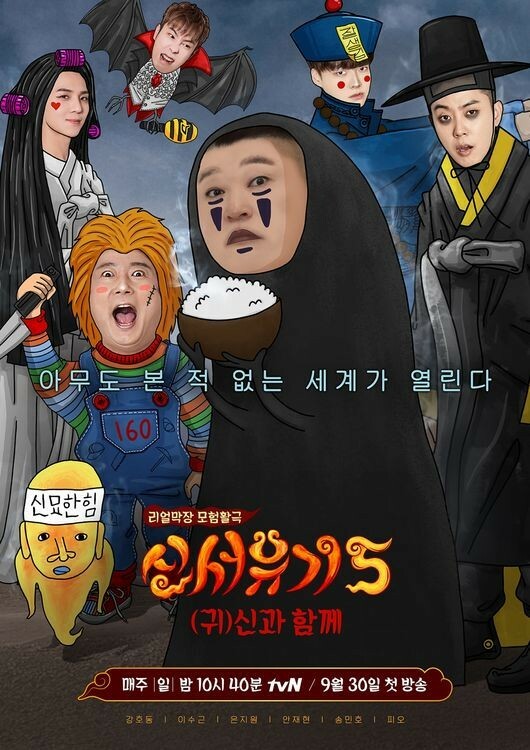 tvN's 'New Journey To The West 5' has released its official poster ahead of its premiere later this month! This season, 'New Journey To The West' will have a secondary title, 'Along With The G(hosts)'. As a result, the new poster below partially takes on a similar format to the film series 'Along With The Gods', but shows the 'New Journey To The West' cast members - Kang Ho Dong, Lee Soo Geun, Eun Ji Won, Ahn Jae Hyun, WINNER's Song Min Ho, and Block B's P.O. - dressed up as ghosts or strange figures from all over the world. If you missed the most hilarious teaser 'New Journey To The West' has released to date, you can also find it above. 'New Journey To The West 5 - Along With The G(hosts)' premieres on September 30 at 10:40 PM KST!